in the early morning i hiked up a side canyon from the grand canyon of the colorado river. 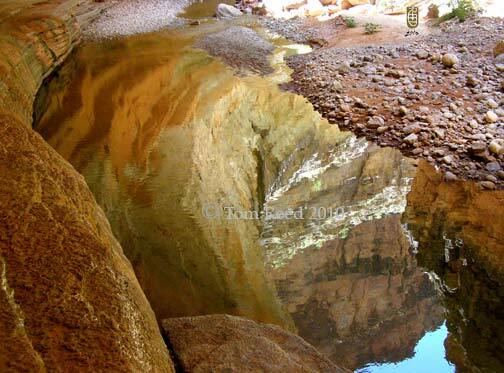 i passed under an overhang where kanab creek cut into the canyon wall, and stopped to turn around and be stunned, “aesthetically arrested,” by the beauty of the reflection of the canyon wall in the pool below. First thing in the morning I’m on a bus to Puerto Natales, Chile, the gateway to Torres del Paine. The granite in that park is said to be as spectacular as the granite I just left, so I thought I’d catch a glimpse while I’m in the neighborhood. But even though I’m in the neighborhood—it’s not far as the crow, or condor flies—I have to take a few long bus rides to get there. I’m hoping for some good photos, but maybe I’ll get rained on, like several travelers have described as their experience of Torres del Paine. On the bus I take that refuge, that rest that comes when it’s impossible to do anything. I look out the window and let my mind wander. Crossing the pampas in the early morning, when the sun greets grasses and brush that have been rained on all night, the subtle colors seem richer than usual; buff, forest green, sage, maroon and grey. Dark blue clouds break off the storm continuing over the Andes and pass overhead, but this landscape is illuminated from the east. The rising sun sometimes strikes directly, sometimes illuminates this land by lighting entire clouds that have drifted downwind from the mountain storm and softened, no longer fighting the sun, but yielding to its power, and accepting the light, and passing it on to the grasses, gently. All of creation is beautiful, this I know. Right away I realize I’m making a dualistic judgement between this and that; beauty and ugliness. I therefore have to ask, ultimately, is there such a thing as beauty, or is it a construct of the human mind? And if there is beauty, independent of the human mind, is there also ugliness? My guess is that there is no such thing, ultimately, but that it is a fundamental aspect of the human experience to enjoy beauty, that is, feel a deep appreciation for creation. And maybe a fundamental aspect of our task as spiritual beings in a physical world is to accept the ugly without repulsion, without reacting, just as the Buddha taught as the way to deal with affliction. Then, I want to know if beauty is entirely in the eye of the beholder, or is there some law of nature that creates a hierarchy of aesthetics? My own appreciation has deepened in the years that I have inquired what makes things beautiful. Has that deepening been entirely personal or have I progressed upon an established path? Am I stuck in some state of semi-halucination initiated by the big peaks that has me still mountain-drunk? Why is the grassland out the window so radiantly beautiful? Is all of creation beautiful? Isn’t there ugliness in nature? I don’t see it in natural landscapes, but I certainly see a progression from ordinary to magnificent. And when I think about it, all of the least beautiful landscapes I can remember were altered by man, recovering from devastation at the hands of humans. What old-growth forest is not on the magnificent end of the scale of beauty? What clear cut is not on the opposite end? Even hurricanes and forest fires are beautiful. Maybe our perception of ugliness is a result of a psychological reaction to perceived suffering or the potential for it. The hurricane is beautiful if witnessed from a safe observation point on land, but will the sailor see beauty as his boat’s rigging screams and the hull succumbs to the fury of the wind-whipped sea? How does the wildfire appear to a man trapped by it before it consumes him? Is the beauty of running game lost when it is taken down by a predator and torn apart as it must be for the predator to survive? Surely there is beauty in that beast’s blood to a starving man. Suffering is part of life, contrary to the fantasies of many who wish otherwise. The Buddha made this his first noble truth. And so there can be beauty in it, if we choose to see it—if we choose to detach from a constructed meaning to it all, and a constructed “I” that is the experiencer. But we need meaning to organize our life around. Maybe our idea of beauty has to do with organization. Certainly life itself is partially defined by organization, hence the name, “organism.” Organization provides comfort. Maybe this comfort is what a human naturally finds beautiful. It’s easy for us to see beauty in organization and geometric regularity. The spiral of the hurricane, when viewed from space, is beautiful, but down inside of it the chaos is more difficult to appreciate. The fact is that all of Nature is organized. It’s just that we usually can’t see it. Most of it appears as random and accidental. I realized this years ago during a meditation retreat in the desert. After five days of meditation it became apparent that it’s human nature to become absorbed into the reality of our own mental ordering. In the next five days I experienced the world with new eyes. Perhaps not so much “new” as our original way of seeing the world, but when we learn to see again it is as if we are in an altered state–that state of an apparent increase in three-dimensionality. The Chinese concepts of “Wu” (logical, linear order) and “Li” (organic, free-flowing order) had been subjects of my own contemplations before the retreat, so as my eyes began to open again, and as the order of all things began to become evident, I framed the experience with regard to wu and li. Early in the retreat I was stunned by the beauty of three young junipers growing from behind a low stone wall. The finishing touch that made the scene such a work of art was the way one stone slanted in a different direction than the others. I saw mostly li—the trees and stones—but there was wu in the line of the planting, and in the plane of the wall. As I passed another wall I began to understand the harmony of wu and li. The stones are li, irregular in size, shape and color. But they are set so that their flat sides form a vertical plane—wu. A harmony of wu and li was created by the artist, the stonemason who chose each stone and decided how to arrange them. Another mason would have made a different wall with the same stones. Of course, humans are not the only artists on Earth. Beaver lodges, bird nests and beehives come to mind right away. We see this art, this creation of some wu from li, this harmonizing. We recognize the order of the circular lodge and nest, the hexagon of the hive. The order that eludes us is that of li. At the li end of the wu-li spectrum is what we see as disorder. The artists in this genre go mostly unrecognized by us. The more a composition approaches the wu, the easier it is for us to appreciate it—for us to find comfort in the organization. The ripples in beach sand and the rows of sand dunes are easier to appreciate than the irregular surface of sand, or sand itself. There are many times when li perfection, though standing boldly before us, is invisible to our eye because we see it as a destruction of the wu that we had created. Various patterns of erosion, decay and oxidation, a decline of organization to our habituated eye, when seen with original eyes, are obviously beautiful. But rarely can we transcend the sense of loss of order. An amusing example of this occurred at the same retreat. I was walking again, and passed an old light-blue Ford station wagon. This was the kind that had panels of vinyl on the sides that were printed with a wood grain to make it look like an old woody—an obvious imitation of li. But the desert sun had dried and cracked the vinyl so that it contracted, revealing the light-blue below in a gorgeous crackle pattern contrasting with the dark brown and black of the vinyl. The wood print was an attempt to bring li beauty to the car, but it was a mass-produced imitation. Now the car was decorated with an original li design, the work of ol’ Sol himself. I smiled and wondered if the owner appreciated it. It is such a strange word, I didn’t understand it for years. The word “sublimation” can be the psychological directing of instinctual desire into a socially acceptable form, it can also be the transition from solid to gaseous form, as water did when I dried my clothes outside in subfreezing Alaska winters. So, “what does it have to do with beauty?” I wondered. It turns out that while the ice in my clothes sublimed, I’d turned my head away from the clothesline to see the sublime; the view of the impassable glaciers flowing down between jagged peaks too steep and loose to climb and bathed in a haze of man-killing weather. In his book “Mountains of the Mind,” Robert Macfarlane discusses the sublime—that is, the awe-inspiring, the imposing beauty of high mountains. He suggests that our current perception of such beauty has evolved since a few hundred years ago when the perception of the inhospitable high country was more one of terror and dread. Maybe the even use of the word “sublime” has evolved away from the fearful towards the beautiful. Maybe it’s all part of a spiritual evolution. What do I mean when I say, “creation?” Doesn’t that imply that there is a creator? We’ll never know if there is one. I use the word because we really don’t have one for “everything.” “Nature” is commonly interpreted to mean things in the natural environment of Earth. I capitalize it to indicate that it is more. “Universe” is taken to mean the stuff in outer space. Neither of these words are commonly taken to include the book in your hands, or for that matter, your hands. The question for me is whether the beauty of Nature is an accident or a coincidence, or is it by design or expression. Does Nature evolve towards beauty, or do we evolve to perceive it as such, or do both happen in concert? In his book, Quantum Evolution, Johnjoe McFadden says that quanta make decisions, and in so doing are guiding evolution as they instigate genetic mutation. It’s all the product of quantum expression, ourselves included, that is proceeding towards a goal. If so, what is the goal? Is beauty part of the plan? Thinking of my recent realization that all of Nature is divine, now I understand that the common element throughout all of Nature is the quanta that it is made of. Could it be that it is the quanta that are intelligent–not individually, but as fragments of an intelligence that is omnipresent? …fragments that are really waves until observed, then materialize … The netzutzot, scattered sparks of divine light, of the Hebrew, and the Aum, sound, of the Hindu, the Shabd, or divine light and sound of The Source, for the Sikh. Speech is organized waves of sound, and in the New Testament John wrote, “In the beginning the Word already existed. The Word was with God, and the Word was God.” Heraclitus used the greek Logos, “saying,” as both the source as well as the fundamental order of the universe. Everything, all matter, might be an articulation by The Source. I find myself in a divine wonderland, and my only challenge is to merge with it. Hello, I just stopped by to learn about this site. It appears really cool and I liked browsing it, thanks for the helpful article! let me know what you are researching, and maybe i can assist your inquiry.